Many people love cheesecake, I do as well. However what I am presenting today is not our normal western styled cheesecake. 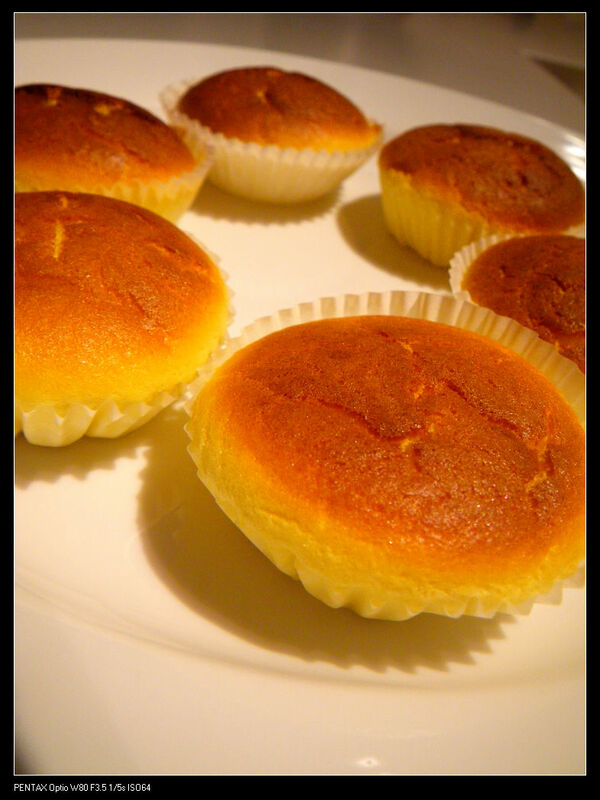 Soufflé cheesecake is the Japanese take on the variety and is much lighter. 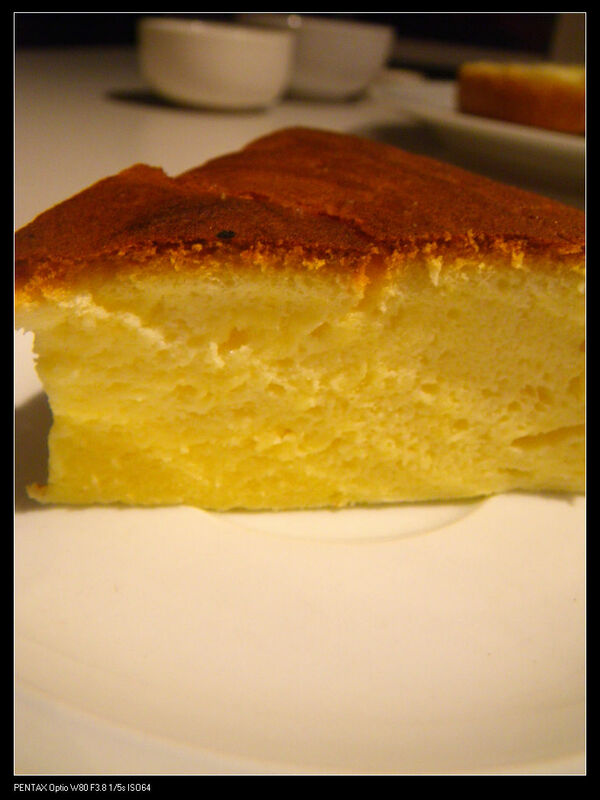 Sometime, it is also referred as Japanese light cheesecake. The cheesecake is fluffy and cotton light and depending on your liking, you can end with a cake with plenty of cheesy flavour or a cake with none of it. It will suit both cheese lovers and cheese haters. The mouthfeel is like to have a soft sponge cake and is very tasty. There has been plenty of recipes on the net but I am going to give a much easier one. I am sure you will love it. Making the cake needed two prepare two parts before mixing them together. 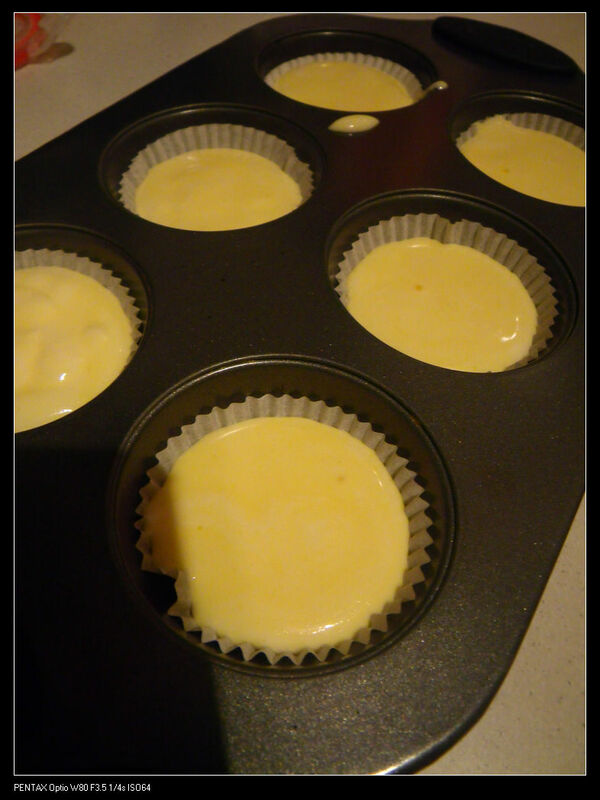 Hence, I name the part with egg yolk, P1 and the part with egg white, P2. 1. 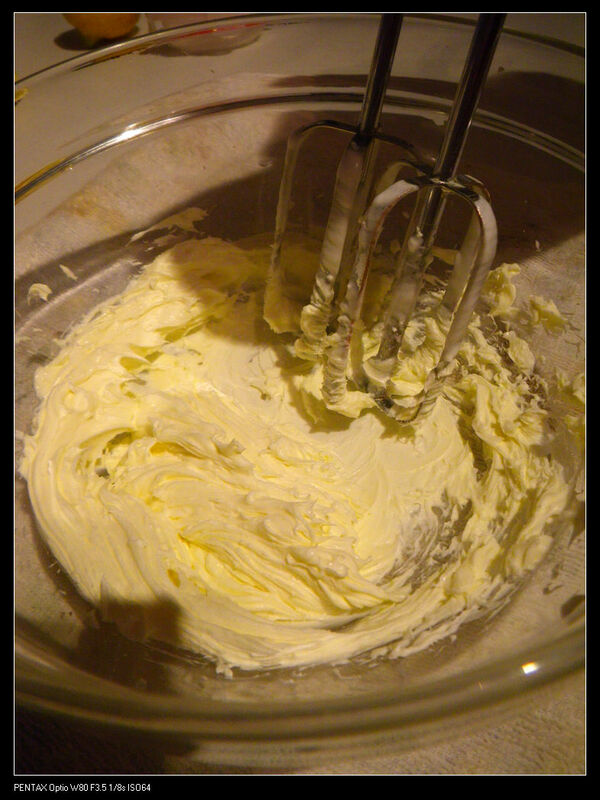 Use a hand mixer to whisk the cream cheese until smooth. 2. Add egg yolks separately, 1 at a time and whisk until smooth each time. 3. 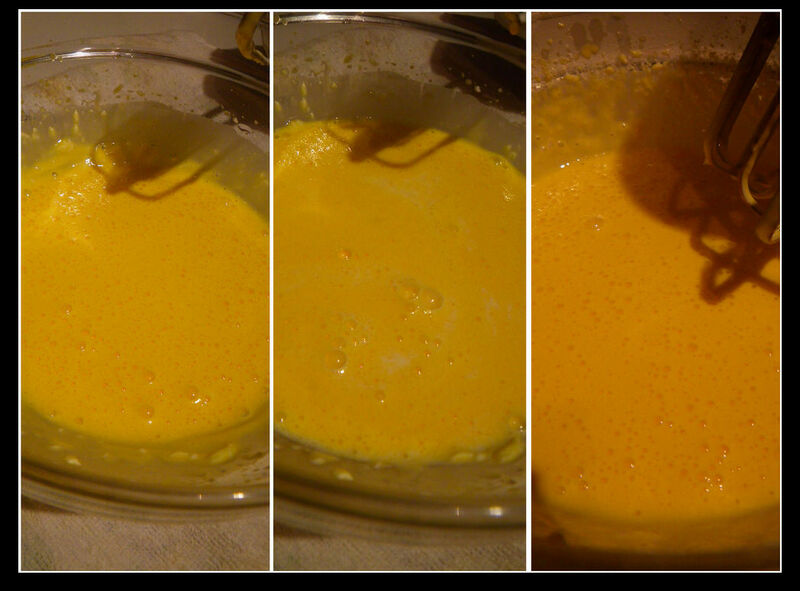 After added all the egg yolks, add sugar, whisk until smooth. Then, add in the milk and whisk until smooth. 4. Mix the sifted cake flour and corn flour and add the mixture to the container in step 3. Whisk until smooth. 5. Add in lemon juice and mix well and then add in canola oil and whisk until smooth. Do not over whisk the content as this can cause cake breakage after baking. 6. 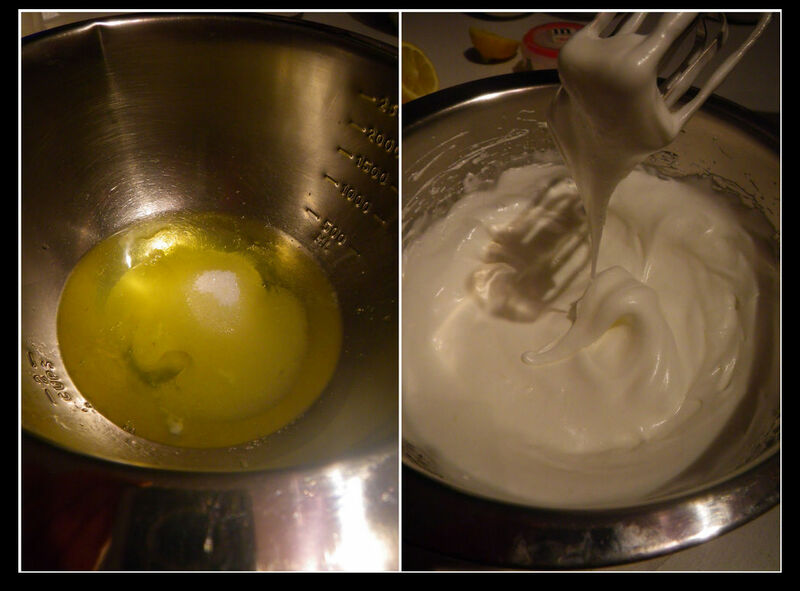 Add the sugar to the egg white and whisk until its wet peak. 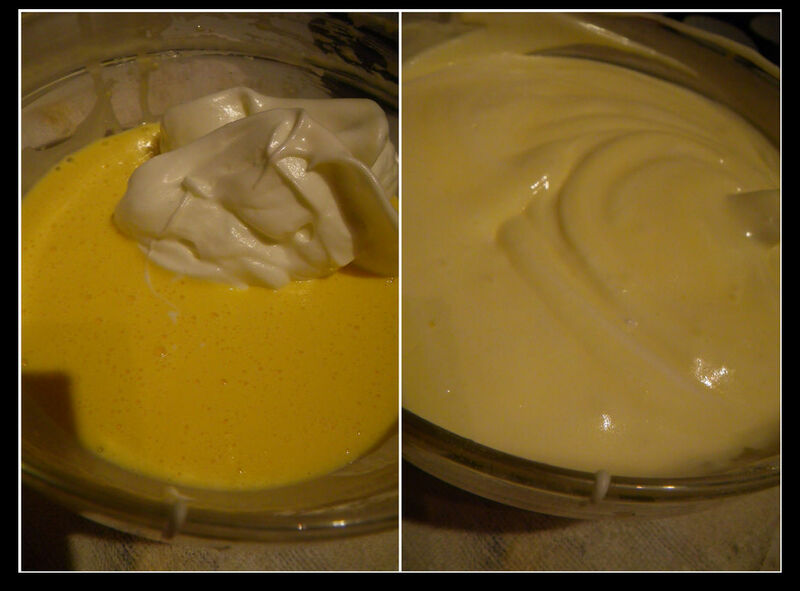 A good indication is that the egg white mixture is like a solid mousse (see picture on the right). 7. Add in the lemon juice and mix well. 8. Mix P1 with 1/3 of P2 initially well and then add in the rest of the P2. Mix thoroughly until smooth but try not to over mix (see the pic on the right below). 9. Lay the mold with baking paper and place the above mixture in. Be sure to tap the content to ensure them to be fully settled down. 10. Preheat the oven at 200 oC. If the bottom of your baking mold is moveable, wrap the mold with aluminium foil. Otherwise, you can place the mold directly on a baking tray. 11. Fill the baking tray with water and bake at 200 oC for 15 minutes initally for coloration and then turn to 150 oC for an hour. Use a bamboo skewer to test. 12. 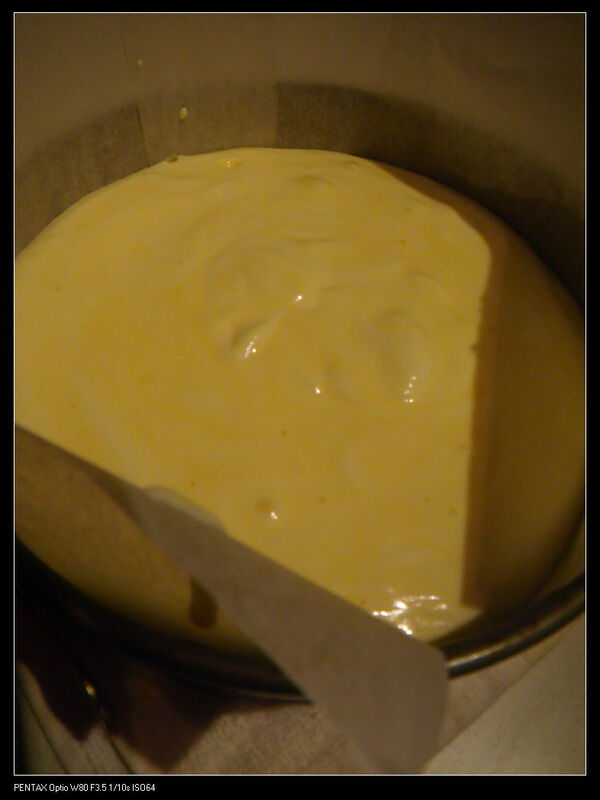 After baking, remove the cake from the mold immediately. Cool the cake to room temperature and enjoy with jam and coffee or green tea. You will see what I mean by a soft, cheesy, light and fluffy cheesecake. Yum! Coming up in the basic Japanese food guide are some reviews of some products I found interesting or good in taste. Stay tuned! It has been a while since I made it last time. My wife cant eat heavy cream or dairy product due to allergy. This has been the perfect substitution! I had this heavenly cake before. Thanks for the recipe… yours look magnificent! What a beautiful cheesecake, true! Love the step by step photos…very inspiring too! Thanks for the comment! How did you go with the cooking yesterday? What a GREAT cooking4acause event at the Central Markets, true! 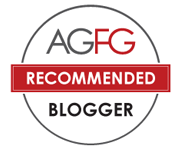 Was very humbled to be chosen to participate from Yelp…Hayley’s (OzHarvestSA) and Silvia Hart’s “PASSION and ENTHUSIASM” bubbled over…blog post to follow when I return from R & R 🙂 Thanks for asking! Could go for a slice of your Japanese cheesecake now! YUM! Although I do not have a sweet tooth, I love cheesecake and yours looks so moist and delicious. The pictures are great! Wow! This looks great! Nice job! t looks very soft or like a cotton texture..
Uhm, I tried baking this cake and I followed your recipe except that I used margarine instead of canola oil. And I baked this cake only for 40 minutes because it was kind of burnt on top of it, and the skewer inserted comes out clean. So I turned off the oven and I let the cake cooled down in the oven with the door slightly ajar. The cake rise beautifully but when I take it out of the oven after 15 minutes cooling, it deflated. And even worse, half top of the cake was light and airy while half bottom of the cake was very dense. Is it because I reduced the baking time? Or should I beat the cream cheese with the margarine first? Or is it because I set the P1 aside too long when I made new meringue because the first one was overbeaten? PLEASE HELP ME!! !